Personal protective equipment (PPE), also known as personal protection wear, is any type of clothing or equipment worn by a person to protect them from some specific hazard. Typically this is protection from any physical, radiological, electrical, chemical, biological, mechanical, or other threat in the workplace. Workplaces are responsible for providing their employees with the proper types of personal protective equipment based on the specific hazards that exist in the facility. There are many types of PPE available to keep people safe. 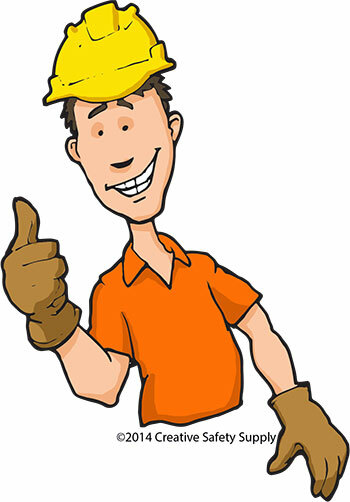 The following are some categories of personal protective equipment and the options within them. Basic Facemask - A facemask can minimize the risk of exposure to simple biological contaminants, dust, debris, and other harmful impurities in the air. In a pinch, even a simple handkerchief could serve as a facemask (though not recommended for regular use). Filtered Respirator - If there are known impurities that can cause serious damage or illness, having a filter on the respirator is important. There are many types of filtered respirators available depending on how many impurities need to be removed. Self-Contained Breathing Apparatus - In situations where the air is extremely toxic, a self-contained breathing apparatus allows the employee to bring a supply of fresh air with them. This is also used when there is no oxygen to breath, such as under water. Many chemicals and other materials can cause serious injuries or illnesses when they come in contact with the skin. When working with these hazards, having proper personal protective equipment is extremely important. Protective Clothing - The most common type of skin protection equipment is general protective clothing. Something as simple as a lab coat helps reduce the risk of getting splashed with potentially hazardous solutions. While it isn't a high level of protection, it is sufficient for many situations. Plastic Gloves - Plastic (or latex) gloves are among the most common types of skin protection equipment. They can keep a wide range of hazards away, including biological and chemical solutions. Cut-Resistant Gloves - Employees who work with sharp objects should wear cut-resistant gloves. These gloves are made of special materials that prevent blades from slicing through them. Heat-Resistant Clothing - When working with fire or other high temperature hazards, employees should wear heat-resistant clothing. This could be heat-resistant gloves or it could be an entire suit, depending on the situation. Electricity-Resistant Clothing - When working with or around high voltage areas, having PPE that can reduce the risk of electrical shock is essential. This could be rubber boots, gloves, or an entire body suit. Face Shields - Face shields reduce the risk of having something splash up into the face, causing damage. Whether working with hot items, corrosive materials, or biological materials, face shields can protect one of the most vulnerable parts of the body. Hard Hats - Hard hats are a great way to keep someone's head safe when working in an area where something could fall on it. Goggles - Simple safety goggles provide a strong layer of protection to the eyes. This is good for preventing objects from flying into the eyes such as sawdust, stones, and shards of glass. Welding Masks - While welding masks sometimes cover the entire face, their main function is to protect the eyes from the extremely bright light of a torch. These masks are darkened significantly to prevent the light from reaching and damaging the eyes. Sunglasses - This is a simple type of PPE that most people never give a second thought. If you're regularly working in the sun or around bright lights, wearing sunglasses can help prevent many eye conditions down the road. Protecting the hearing of employees is very important, but can be difficult. Many people don't notice when they are working around the constant noise of a factory or other workplace. While it may not be something people realize is happening, this can cause significant damage to the hearing over time. Wearing personal protective equipment for the ears is critical. Ear Plugs - Ear plugs are easy to use and provide a fair amount of protection by preventing loud noises from entering the ear at all. Ear Muffs - Ear muffs go over the entire ear, and when worn properly, can provide a significant amount of noise reduction. Electronic Ear Muffs - These advanced hearing protection devices work like ear muffs to stop the noise from coming in, but also have an electronic microphone that picks up voices and other noises and then plays them into the ear so people can still hear. The sounds are played at a low level so they do not cause damage. There are different types of personal protective equipment for just about every situation. Figuring out what type is needed in a facility is a matter of evaluating the risks and determining what PPE can offer the needed protection. Once a facility has purchased PPE, it needs to be stored in such a way that it is kept safe, but is also available to the employees when needed. Some PPE is used every day, in which case the employees may take it home with them and wear it in to work the next day. Other times the PPE is only needed in certain situations. When this is the case, employees need to know exactly where to look for the personal protective equipment they need and how to access it. If the PPE is kept in a closet, make sure that the closet is clearly labeled. This can be done using an industrial label printer or a sign. However it is marked, make sure it can be seen from throughout the area. Ensuring employees have access to the PPE is just the first step, however. It is important to make sure that the personal protective equipment is stored neatly so it is not difficult to grab and use. Gloves should always be kept in matching pairs that can be grabbed and put on fast. Pants should be folded up neatly. When Is Personal Protection Equipment Needed? Ensuring employees know when they need to put on personal protective equipment is essential to the safety of the facility. As mentioned above, some PPE needs to be worn at all times, which makes it easy. Most PPE, however, is only required occasionally. When that is the case, employees need to be trained about when it is recommended and when it is required. A good place to start when determining when PPE is required is the OSHA rules and regulations regarding personal protective equipment. OSHA provides excellent guidelines in this area and can help make the planning much easier. 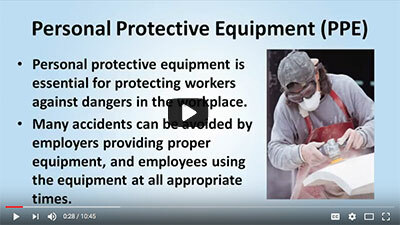 To get a good idea of when OSHA requires personal protective equipment, watch this following video. It goes over many of the rules put in place by OSHA and is a good place to start when planning PPE requirements. 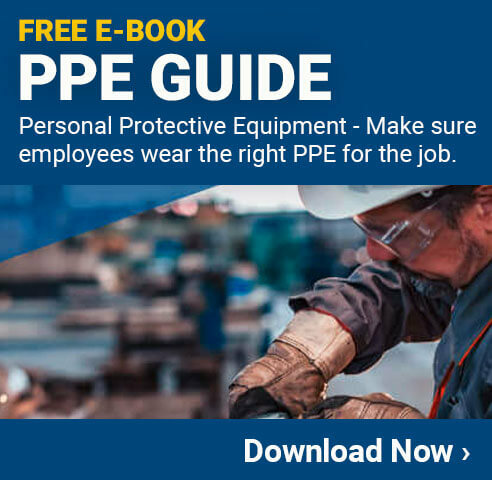 Once it has been determined when and where employees need to wear each type of personal protective equipment, it is important to make sure employees are aware of their responsibilities. In addition to providing them with training, many facilities use personal protective equipment signs. PPE signs can be purchased pre-printed or they can be created in-house using an industrial label printer. However the signs are made, they should be put up in all areas where PPE is needed. Signs can specify when the equipment must be worn (when a machine is on, when performing a set task, etc.) and which type of PPE is needed. These signs serve as an excellent reminder to employees that they must wear the proper equipment at all times. Some employees will be hesitant to use personal protective equipment because they think it will just get in the way or they won't get hurt without it. The fact is, however, that using PPE is a proven way to improve safety in a facility. Even if employees find it annoying or resist using it, facilities are responsible for making it mandatory. Most facilities go beyond what OSHA and other regulatory agencies require because they know just how well PPE works. In addition to keeping the employees safer, PPE allows the facility to operate more efficiently and profitably. Workplace injuries can cause significant disruption in the flow of work and can also cost a facility a lot of money through workers' compensation or lawsuits. Even in cases where the PPE causes an initial slowdown in the way employees work, it will be worth it in the end. The improved safety of the facility more than makes up for any temporary loss in production speed that may occur when adding or expanding the use of personal protective equipment in a facility. All facilities need to make sure their policies regarding personal protective equipment are perfectly clear and that employees follow them at all times. By making this mandatory, employees will quickly get used to it and in most cases find that it is actually a good thing for them and the entire facility. Eliminate - When possible, eliminate the hazard completely so employees are not exposed to a specific danger. Substitute - Remove one hazard and replace it with one that is safer. For example, removing an outdated machine with few safety features and replacing it with a new model that is much less risky. Controls - Engineering controls to minimize danger can be very effective. This is essentially just containing a risk so employees and the facility are as safe as possible. For example, having any high heat processes conducted in a smaller, fire protected, room will confine any risk to this one area. Administrative Controls - Using rules and regulations to reduce the risk. Telling employees they must follow a set process when working on a machine will reduce the overall risk. Personal Protective Equipment - Using personal protective equipment is only a last resort. It is there to protect employees in case all the other options should fail. While personal protective equipment may be the last option when it comes to keeping employees safe, it is still extremely important. PPE can reduce the risk of injury and in many cases can minimize the effect of any accident that does take place. This is why using PPE is not just a requirement from OSHA and other regulatory agencies, but it is also a good business practice.